Blackbirds, thrushes, finches – who doesn’t enjoy hearing these beautifully singing birds? Except of course if you happen to grow currants in your garden. Then suddenly these birds turn into voracious monsters that plunder the bushes before you’ve had the chance to harvest a single bunch of currants! The recipe on this page uses redcurrants (Ribes rubrum), homegrown or from the greengrocer’s. 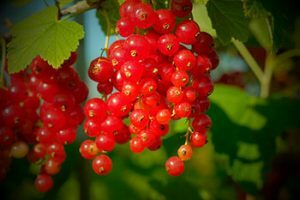 The Ribes-family contains many varieties, but only three are generally used in the kitchen: redcurrants (whitecurrants that are simply a deviant sort of redcurrants), blackcurrants (Ribes nigrum), and gooseberries (Ribes grossularia). These are indigenous to Europe, but came late into cultivation: first gooseberries in the thirteenth century (see the recipe for roast mackerel with three sauces), around 1500 redcurrants (especially in the Netherlands and Danmark), and a century later blackcurrants. In Dutch currants have several names. Not only (red, white and black) berries, but also aalbessen and Sint-Jansbessen. They are called Sint-Jansbessen or Saint-John’s Berries (German: Johannisbeeren) because the berries are ripe around the Celebration of Saint John the Baptist (June 24), and aalbessen or aleberies because the juice was used to make drinks with. The English word ale is related to the obsolete Dutch word aal, so aalbessen could be translated into drinkberries or simply aleberries. What kind of drinks can you make with berries? Redcurrant wine was once very populair in the Netherlands with women because of its sweet taste. 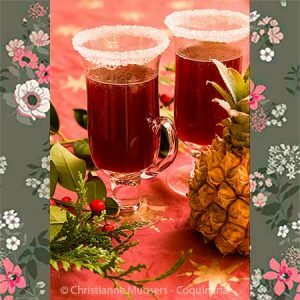 Other drinks with currants are blackcurrant gin, Crême de cassis, and a soft drinks called cassis, to name a few (cassis is French for blackcurrants). In the untitled manuscript from around 1500 that is the source of the recipe below (signature UB Gent 476, editie Jansen-Sieben and Van Winter, see bibliography), the dish is called most (English: must or stum). 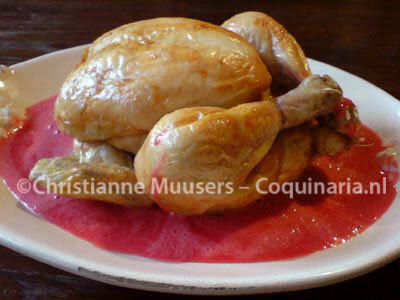 The sauce is prepared with redcurrant juice and sugar and thickened with egg yolks. The very first recipe in this manuscript is also a most, but in that one the red wine is thickened with bread crumbs and coloured purple with turnesole. Both sauces are meant to be served with roast chicken. The name most refers to very young wine, freshly pressed. All lexica I consulted mention this, none mention that is can also mean a kind of sauce. Oldfrench cookbooks also have their recipes for most sauce, like the Viandier (late thirteenth century, edition Scully recipe 38, see bibliography) and the Ménagier de Paris (late fourteenth century, edition Brereton and Ferrier II v 150, see bibliography). This sauce is also to be served with roast chapons, hens or cockerels, but there is no actual recipe. A younger manuscript of the Viandier specifies that most sauce is prepared during winter by boiling together wine and sugar, and according to Ménagier this is so in all seasons. This recipe is the ancestor of the first recipe in ms UB Gent 476. The version with currants is not mentioned in medieval French manuscript sources. The printed Viandier from 1486 (edition Hyman pp 46/47, see bibliography) mentions a Most jehan, also for roast chapons. But this is a milk sauce with herbs and sugar, something completely different. Another Dutch cookbook, the second part of the convolute KANTL Gent 15, shows a recipe for Saus tot aelbesijen (Sauce with redcurrants, editie Braekman p.74, recipe 168, see bibliography) that bears resemblance to the most-recipe below. Here, redcurrants are boiled with wine, the juice is strained and thickened with egg yolks and butter. There is no serving suggestion. From ms UB Gent 476 (edition p.78). This manuscript has been published most recently: in 1998 the second, revised edition by Ria jansen-Sieben and Johanna Maria van Winter appeared. Om te maecken most [van ander]. To make most sauce (of something else). One will take red berries and work them through a sieve. Take the juice and add yolks of eggs, prepare it just like one makes Italian eggs and add as much sugar as you want it sweet. This one can pour over roast chickens, or serve as Italian eggs. Redcurrant juice is brightly red in colour. If you add egg yolks, the colour will change to a lighter pinkish red. I used one yolk, and ended up with a slightly thickened, frothy sauce. If you want to serve this dish as Italian eggs (zabaglione, here is an authentic fifteenth century Italian recipe), simply add more yolks. Main dish for 4 to 6 persons, depending on menu and appetite; preparation in advance 10 minutes; preparation 15 minutes + roasting the chicken. Stem the currants with a fork. Obtain juice by pushing the currants through a sieve or passe-vite (food mill). Using a blender will result in squashed pips. With the finest plate in the passe-vite I obtained 170 ml (between 2/3 and 3/4 cup) juice from 2 2/3 cup redcurrants. Roast the chicken. I left the chicken pretty much as it was, just basted it with butter and put it in a convection oven at 125 °C/255 °F, on a grill above a tin with some water. No salt, pepper or other spices added. After two hours I had a golden brown and succulent bird. Check the core temperature of the chicken to see whether it is done (80 °C/175 °F). If you lack a thermometer, just prick with a knife between thigh and breast. If the liquid is clear, the chicken is ready. Before carving, leave the chicken on the worktop, covered with crinkled kitchen foil (shiny side inwards) for ten minutes. The chicken can be skinned and deboned before serving, just portioned, or even served whole to make a show of carving at the table. You can rub the chicken with spices if you want to, just take care not to use paprika or pre-mixed spices (most commercial spice mixes for chicken contain paprika). Paprika, like chili pepper and bell pepper, was not yet in use in Europe at the beginning of the sixteenth century. Alternatively, you can roast the chicken in a closed charcoal grill to get an authentic taste. Here is another medieval recipe for barbecued chicken. Prepare the sauce just before serving. Whisk the egg yolk with sugar and add redcurrant juice. Pour this into a skillet with a thick bottom. Stir constantly (or use an electric hand mixer) at medium heat until the mixture has thickened without boiling. This can take five to ten minutes. Don’t forget to scrape the bottom and sides of the pan, or you’ll get a lumpy sauce. For a thicker sauce or zabaglione, simply use more yolks, but the colour will become less vibrant. Arrange the warm chicken meat on a serving dish or individual plates, en pour the sauce over or around it. When eating this dish ‘ in period’, with your fingers, the meat should not be served piping hot. In Dutch currants have several names. Similar to English (rode, witte and zwarte) bessen, but also aalbessen and Sint-Jansbessen. They are called Sint-Jansbessen or Saint-John’s Berry (German: Johannisbeeren) because the berries are ripe around the Celebration of Saint John the Baptist (June 24), aalbessen or aleberies because the juice was used to make drinks with. The English word ale is related to the obsolete Dutch word aal, so aalbessen could be translated into drinkberries or simply aleberries. What kind of drinks can you make with berries? Redcurrant wine (once very populair in the Netherlands amongst women because of its sweet taste), blackcurrant gin, Crême de cassis, cassis soft drinks, to name a few (cassis is French for blackcurrants). W.L. Braekman, Een nieuw zuidnederlands kookboek uit de vijftiende eeuw. Scripta 17, Brussel, 1986 (vols two and three). 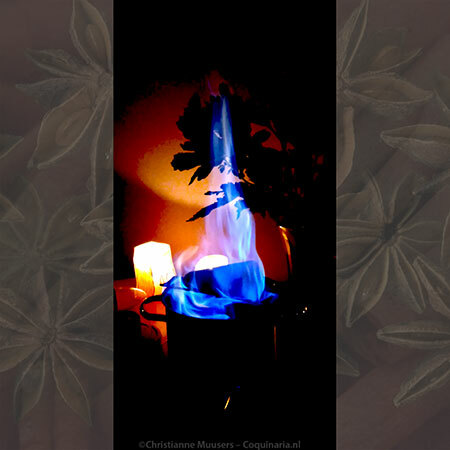 On this site there is an edition in progress of this manuscript, with translations in modern Dutch and English by Christianne Muusers. Manuscript UB Gent 476: Manuscript UB Gent 476: Ria Jansen-Sieben and Johanna Maria van Winter, De keuken van de late Middeleeuwen (The kitchen of the Late Middle Ages, Bert Bakker, Amsterdam, 1998, 2nd revised edition; first published 1989). Alan Davidson, Tom Jaine The Oxford Companion to Food (División Academic) . (Oxford, 2006; link goes to the third revised edtion of 2014). Terence Scully, The Viandier of Taillevent: An edition of all extant manuscripts , Ottawa, 1988. Le Viandier d’après l’édition de 1486, facsimile edition by Mary and Philip Hyman (Éditions Manucius, 2001).